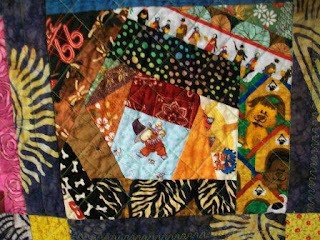 My latest quilt is another scrappy one. I've been trying to use up some of my scraps, but feel the need to do a non-scrappy one or two next. This one uses 10 in scrappy blocks that are then put together with 2 in wide sashing. 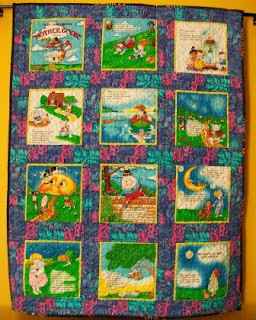 The next several pictures show some of the fabric details I hope the child will find interesting. This one has a moon, a girl, flowers, a feather, and several colors. And this one has a dancing cat in the center, dogs, leaves, carolers, and more. 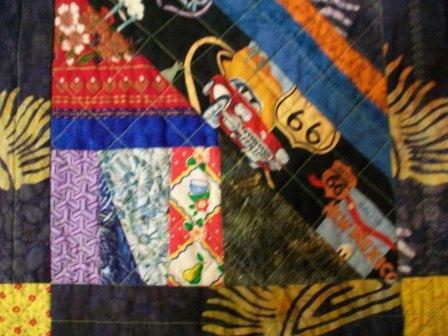 And this one has a car, route 66 sign, a tea cup, and flowers. 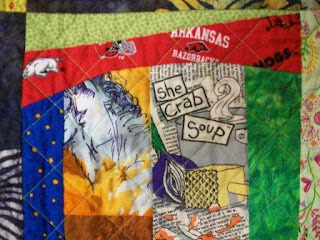 This one has Arkansas razorback fabric, polka dots, “she crab soup,” and flowers. 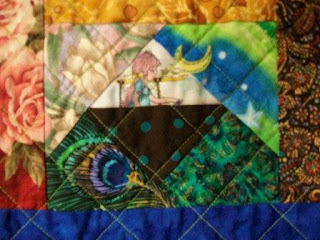 The back of this quilt is pieced also using a "book" panel with the pages being the blocks. 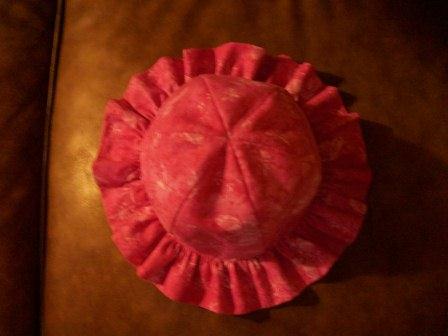 The sashing on the back is 3 in wide. I've gotten fair at knitting scarves, shawls, hats, etc and for the most part have been pleased with how those projects turn out. I can't say the same for my attempts at knitting garments. 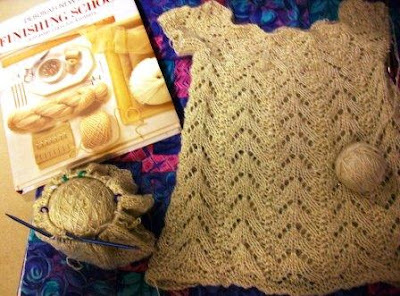 Take for instance these examples: the green sweater in this post I’ve worn just once, this sweater which I gave away, and this sweater which I gave away as it bugged me that the yoke lace isn’t centered. Here are two more to add to those. 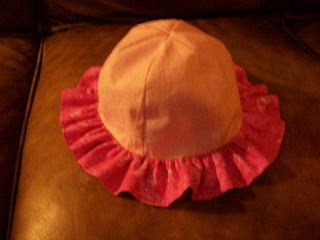 This first one is a poncho. I love the lacy pattern. I love the yarn. 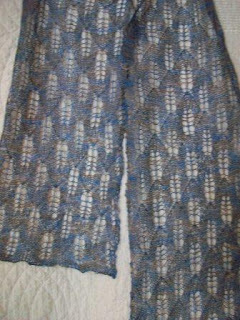 But I don’t feel it is long enough and the pattern instructions for making it longer are, for me, confusing and distract from the previous overall lace pattern. This next one is a sweater. I did make a swatch and rechecked it after I realized the garment was too small which turned out to be correct. Turns out I knitted the wrong size, so I have restarted with the yarn from the “frogged” poncho after highlighting the correct size in the pattern. If I need the yarn from the small sweater, then I’ll frog it. If not, then I may give the small one to a friend’s daughter. The book (Finishing School: A Master Class for Knitters) in the above photo is one I recently bought in an attempt to improve. I want to knit garments that fit properly and are a pleasure to wear. The book has already given me information I wasn’t aware of such as tips on “reading a pattern” to see if it’s even worth trying, choses the right yarn, and has impressed on me the importance of swatches. I saw a flyer at work today for an upcoming blood drive. The last few years I given blood on my birthday. This year (in just 6 wks) I will turn 55. It occurred to me as I was walking my dog and listening to Sammy Hagar sing “I can’t drive 55” that perhaps with a little help from you I could “drive 55” of you to donate blood. I would like to ask my readers, family, and friends to go to your local hospital or Red Cross and donate a unit of blood. Then let me know that you did either by comment here or by sending me a tweet. You can donate in honor of a friend/family undergoing cancer therapy or one who is getting ready for a major surgery or simply as a “gift” to me on my 55th birthday. While it is true that we aren’t as quick to transfuse individuals with chronic conditions, blood is still very much needed for acute bleeding situations such as trauma, burns, major surgery, GI bleeds. 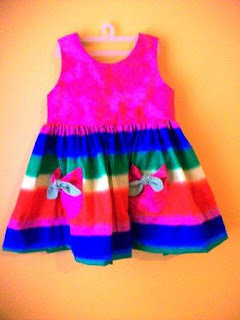 Here are three simple sewing projects I have done recently. 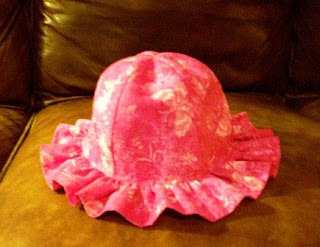 This first one is a simple sunhat made for my great-niece (just 4 months old) using Butterick pattern B4110. 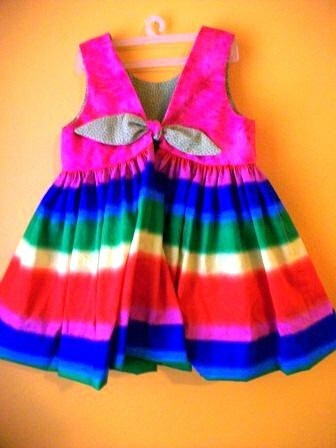 This little sundress is for a niece who just turned two. It uses Simplicity pattern 9685 which is a favorite of mine. 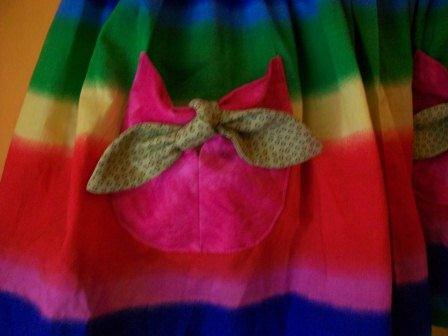 This next photo shows the bow detail at the pocket. This one is truer to the colors. Catching up on some of my journals that have been stacking up, one PRS journal had four articles relevant to fat grafting. If this topic is of interest to you, all four articles are worth the read but especially the second (which discusses the first) and third (great discussion on how fat survives or doesn’t). …..Lipoaugmentation of the breast has been controversial, however, due to concerns regarding its interference with mammography and cancer surveillance. We have demonstrated that when compared with a widely accepted surgical procedure of the breast, reduction mammaplasty, lipoaugmentation with autologous stem cell enrichment produces lower rates of radiographic abnormalities and a more favorable Breast Imaging Reporting and Data System score. There are a number of interesting issues raised by this article. First, what is the ideal control or comparison group? Are patients who have had breast reduction surgery the best control? Second, although multiple radiologic abnormalities are evaluated in this study, the major concern with lipoaugmentation is the development of suspicious calcifications,10,11,14 and more attention could have been focused on that specific question and the almost three-fold higher incidence of this finding in lipoaugmentation patients. Third, the findings of the article raise significant questions as to where the fat is actually injected—that is, around versus into the breast parenchyma. Fourth, the study employs radiologists who are specifically trained in breast imaging, which might not reflect the skill sets of radiologists found at most diagnostic imaging centers across the United States today. In addition, even among this highly trained group of radiologists, intergrader variation was high. Finally, this study uses a lipoaugmentation technique (creating stromally enriched adipose tissue) that is presumed to concentrate stem cells; this protocol is not a widely used method, and it is not relevant to the main objective of the study. This study focused on the early phase (0=14 days) of the healing process after nonvascularized fat-grafting. Adipocytes are most susceptible to death under ischemic conditions, although adipose-derived stromal cells can remain viable for 3 days. The article includes a great figure (#6) which graphically illustrates the three zones of ischemia for fat grafts. Think of a sphere with the 1st zone being on the outside: 1) “surviving zone” is the most superficial zone, is less than 300 μm thick, both adipocytes and adipose-derived stromal cells (ASCs) survive here, 2) “regenerating zone,” thickness varies depending on the microenvironmental conditions such as vascularity of and attachment to the surrounding tissue, in this zone adipocytes die as early as day 1, but adipose-derived stromal cells survive and provide new adipocytes to replace the dead ones, and 3) the most central zone is the “necrotic zone,” where both adipocytes and adipose-derived stromal cells die, no regeneration is expected, and the dead space will be absorbed or filled with scar formation. Fat grafting remains one of the most controversial procedures in plastic surgery because there is no standardized technique used by plastic surgeons to harvest, process, and place fat grafts. In addition, and most importantly, how the fat grafts survive after they are transplanted in vivo remains unclear and needs to be determined. The present study was conducted by Dr. Kotaro Yoshimura's group from the University of Tokyo, one of the most active teams in the field of fat grafting and adipose stem/stromal/progenitor cell (adipose-derived stromal cell) research. The study, composed of two parts, is another example of an important and well-conducted study in understanding the mechanism of how fat grafts survive after transplantation. ….. most adipocytes in the graft site begin to die on day 1 and only some of the adipocytes located within 300 μm of the tissue edge would survive. The number of proliferating cells increases from day 3, and increases in viable adipocyte areas can be detected from day 7. Although the present study is well conducted, with sound and contemporary methodology, I would encourage the authors to perform a long-term in vivo study, such as 2 to 3 months in the same animal model, which may be equivalent to approximately 6 to 12 months in humans.. This quilt was made for a young friend recently diagnosed with breast cancer. 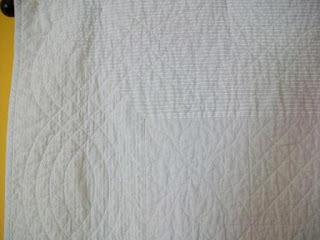 When I asked what color she would like her quilt to be, she said white. 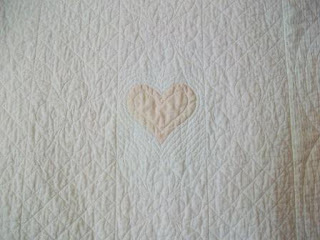 Then she suggested a single pale pink heart in the center. I honored her color choices but the heart is place slightly off center. The quilt is not a true whole cloth quilt but has that look. The center is a 30 in X 42 in piece of plain white fabric quilted as if it where made of 6 in blocks.The border is of white-on-white striped fabric with mitered corners. 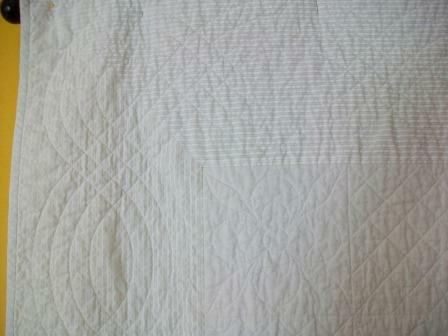 The quilt is machine pieced and quilted. 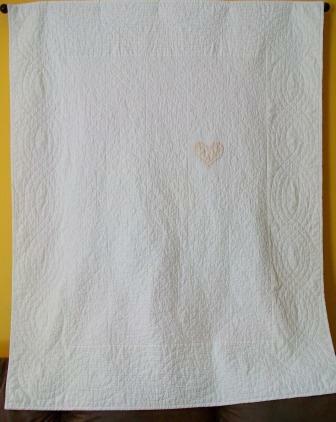 The heart is hand appliqued. 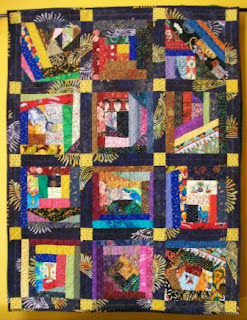 The quilt measures 46 in X 57 in. This next photo shows the pink heart and quilting a litter better. This photo shows the border quilting. I am one of the physicians Dr. Zilberberg (@murzee) mentions repeatedly in her book “Between the Lines” who don’t understand statistics. I know it is one of my weaknesses. Her book has done much to aid my understanding. I will re-read it and pass it on to my niece who has mentioned she might want to go to medical school. I had already told her to make sure she took a statistics class. The book is easy to read and @murzee makes the concepts easier to understand than anyone I have ever heard/read. If you want to gain a better understandings of the different types of scientific studies, biases, and statistical analysis, then“Between the Lines” is a must read. I recently finished knitting this scarf. 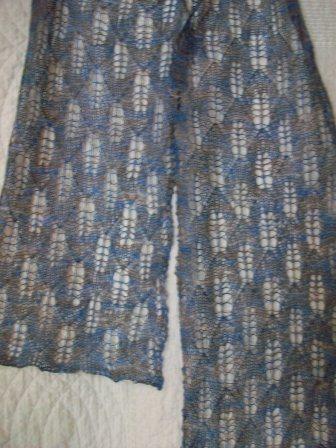 I used the pattern Three Sisters Scarves # Three by Monika Steinbauer. 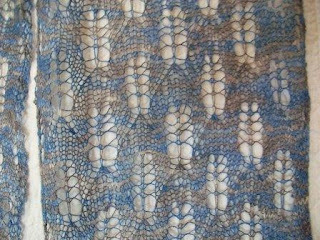 The yarn is Blue Ridge Yarns Silk Shimmer Lace yarn (100% silk. Finished and blocked, the scarf measures 10 in X 66 in. It has a light and airy feel which is lovely. and here's a closer shot. I really like how it turned out.